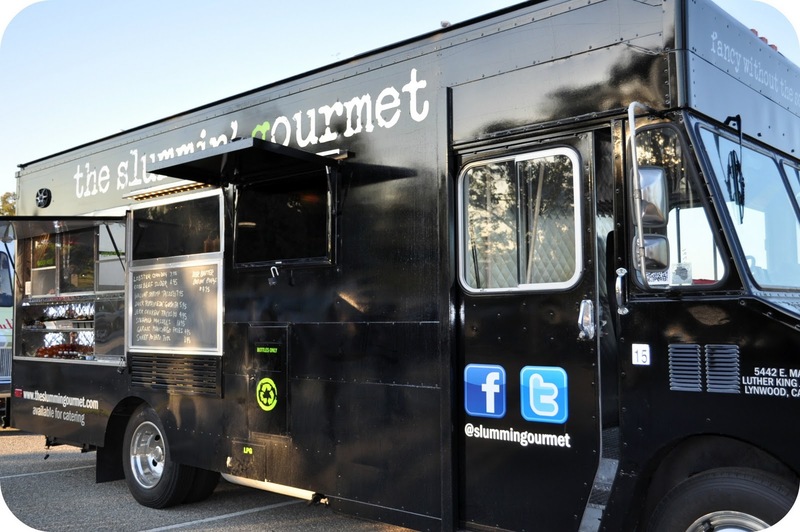 Anyone ever heard of a truck called The Slummin' Gourmet? Neither had I, but with a slogan like: "fancy without the schmancy" I just had to try it! Pretty sweet truck huh? It has a flat screen television mounted to the outside of it...because who says you can't enjoy some entertainment in the middle of a parking lot? Now, upon browsing the menu saying that I was intrigued is an understatement. I mean, honestly...LOOK AT IT! Lobster corn dog? Duck gordita?! This truck was not kidding when it said it's gourmet. After talking my options over with the little bros we ended up ordering the Walnut Shrimp Tacos and Garlic Manchego Fries. Doesn't that taco look amazing? To call it a taco is a bit of a misnomer, everything was sitting on lettuce leaves so I would classify it more of a Walnut Shrimp Lettuce Wrap. The taco consisted of walnut shrimp, balled honeydew, a type of sauce that you usually get honey walnut shrimp in, candied walnuts, and rice noodles. The concept is ridiculously bold. Not something a lot of people would think of, let alone try, but this truck took a shot at it and scored. Big time. My first bite was a crazy fusion flavor explosion. 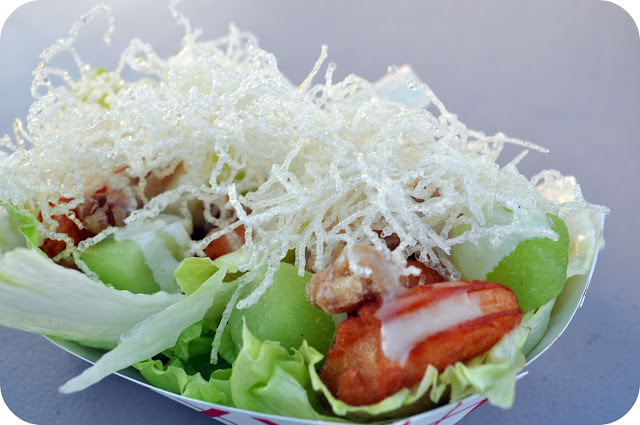 The sweetness of the honeydew and roasted nuttiness of the glazed walnuts counteracted the saltiness of the walnut shrimp, the rice noodles added a nice crunch that wouldn't have been there without them, and the lettuce surrounding the whole thing acted as a palate cleanser with it's neutral taste. The shrimp was fried but it wasn't soggy, it had a nice bite to it, but whatever it was battered in had a hint too much salt. There was a good amount of shrimp and toppings in each taco, very good portion for the price of $7.95. So these bad boys caught my eye when I read there was manchego cheese on them...my brothers on the other hand, were excited to hear that there were curly fries at the festival. These ran us $4.95 and I have to say, I was bit underwhelmed by the portion size considering the price. The fries themselves were good. Not greasy, nice crisp, perfect golden brown. There was garlic, parsley and manchego cheese bits covering the whole order. The first bite left me confused, because all I tasted was a curly fry. For my next bite, I made sure I had some of the toppings visible on the fry. Manchego cheese is a firm cheese so the bits had a good texture to them. 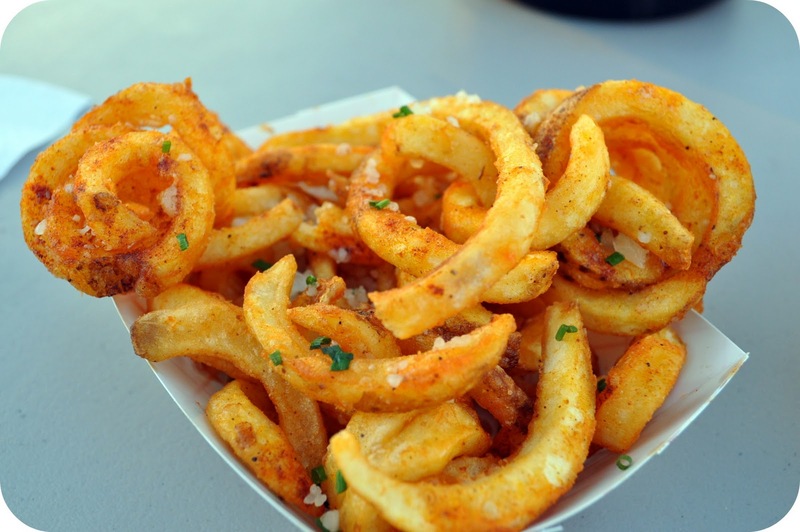 These particular cheese added a buttery, salty flavor to the curly fries, definitely something unique, however the lack of cheese made it hard to get more than a few really good bites out of the order. I really couldn't taste the garlic at all, I could see it, but there wasn't much on our order, maybe next time I'll ask them to really top it on there. I think the fries would have really been something amazing if the manchego was melted down to give the dish another texture element. It was just lacking something...a dipping sauce perhaps? I was kind of disappointed that these fries weren't as crazy delicious as I thought they would be, but, hey, maybe it was just an off order. Overall, I'd recommend this truck to my other foodie friends. 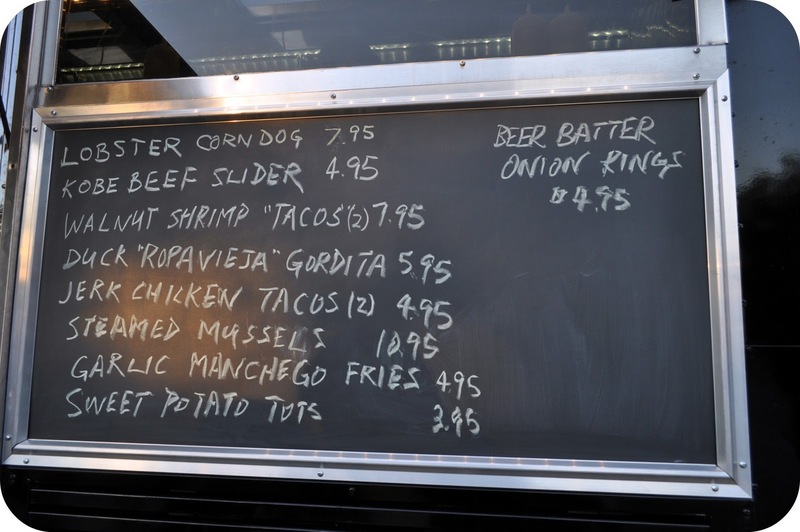 There's still some menu items I'd like to try the next time I find this truck, I'm not one to just dismiss a restaurant because of one okay experience.